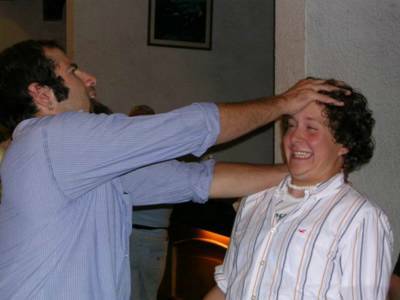 A young team member gets blasted by the Holy Spirit in Mexico with shaking and laughter as John prays. Earlier, he was hit so hard, he fell over, smashing a metal chair in the middle of a service. Notice what looks like a flame of fire coming from him! I just returned from the Baja Peninsula, where I co-led a team of 15 young adults from Homer for two evangelistic healing crusades. We saw the supernatural power of God move in ways many have only read about in the Bible. The deaf began to hear; the blind began to see; cripples got up from their wheelchairs; demons were cast out and literally thousands received Jesus Christ for eternal salvation. We joined up with other young adults from across the U.S. and Canada. The trip began intensely as a friend – a former Bible school student and skeptic – began speaking in tongues for the first time on the way to the airport! 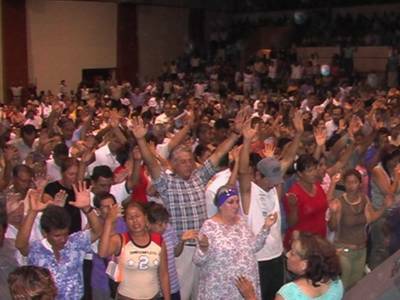 As soon as we arrived in Mexico, you could feel the Holy Spirit drop. I had an immediate vision of an angel imparting power to break off abuse. Throughout the rest of the trip, each time I prayed to break spirits of abuse, violence and addiction, men and women would begin to weep and drop under the power of the anointing. During the crusades, the miracle power of God was intense. People who had been deaf for years began to receive their hearing. A boy was even healed of Down Syndrome, which was confirmed by a local pastor who knew him. But the miracles were not confined to the platform. Even teenagers were pulling people out of wheelchairs. The faith level was high, and we probably saw an 80 percent healing rate for everyone we prayed for. I personally saw tumors, cancers, arthritis, eye burns, gastritis and other ailments disappear with a simple prayer. After prayer for a cross-eyed child one night, one of his eyes straightened out. The next night, we prayed for the other one to come into alignment. Hundreds respond to a call for salvation in a single service. More than 1,400 received salvation over the course of the trip. As we ministered deliverance, many people would writhe on the ground, foaming at the mouth, scratching and swinging their fists as demons were cast out. And not just in the meetings – we saw a number of people healed and delivered in the streets. One team member cleaned out a whole hospital waiting room, with everyone getting saved and healed, except for one person who refused to get prayer! After being denied access to another hospital, we went to a rehab center, where I was able to give my own testimony of the Lord instantly delivering me from heavy drug and alcohol use. The whole rehab center, including the administrators, got saved! Also, at one crusade, a high ranking Mexican senator was saved. We also prophesied over a number of people, calling out their destiny, and hundreds were filled with the Holy Spirit. Sometimes, there were so many people struck with the power of God that their bodies were just strewn around, falling on top of one another. Local pastors were working together, with Spanish-speaking ministry teams on hand to plug new believers into churches after we left. Some other remarkable healings worth noting: A man who could not move after being electrocuted and falling off a scaffold was healed as gold dust miraculously appeared over his face during prayer. He checked himself out of the hospital that day and came to the crusade that night! We prayed for an old man with jaundice who had been a Tibetan Buddhist for years – one of the toughest demonic strongholds to crack! He began to shake and cry under the power of the Holy Spirit before we were kicked out of the hospital in mid prayer. The Lord created new eyeballs for a child with no eyes in his sockets! We prayed for a homeless couple on the street, and the woman’s feet were instantly healed of swollenness and pain. When we prayed for her boyfriend, he rolled down the steps, foaming at the mouth, his eyes fluttering in the back of his head as a demon manifested. The Lord delivered him pretty quickly, then he received salvation. We then prayed that one of his internal organs would be restored, where he had a huge scar on his belly. Under my hand, I could physically feel something pop up under the skin, and he said he felt all the pain go away. Five minutes later, we had him translating for us as we prayed for someone else. I prayed for a man with diabetes, and he said he could physically feel the infirmity leave his body! The nations are so HUNGRY for revival!! Praying for a deaf man to receive hearing. God is moving in our day! There is a very transferable, tangible healing anointing that can be imparted from one person to another. Impartation, through the laying on of hands, is one of the most fundamental principles we have lost in the church. Remember, Paul speaks of it as a very elementary teaching, yet we do not even understand its most basic dynamics. Just as Jesus imparted the Holy Spirit to his disciples, so the Spirit is passed on to us in the same way. This is why a team of 15 people from Alaska, some of which had never so much as spoken in tongues or fallen over in a church service, could operate in miracles, signs and wonders. And we must believe that Jesus WANTS to heal ALL! Bodies pile up under the heavy weight of the anointing after the crowd is baptized in the Holy Spirit en masse.